To get started, from the Engage menu, select the Templates tab. Click Create New Template. In the Elements pane on the right, drag Dynamic Grid into the design window. Select the grid and navigate to the Details pane on the right, which offers a variety of options for configuring the grid, including content, color, layout, and padding. Feed: The dimension of content used to populate the grid. The Feed will default to Products, as this is most commonly used. 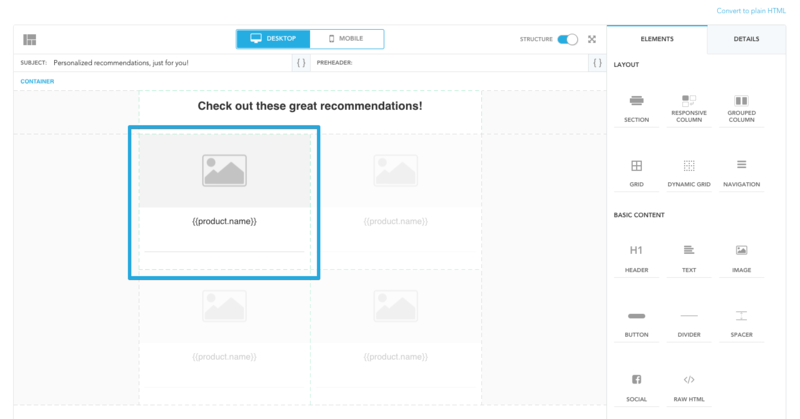 Source: The data reference used to populate the grid - this is where to attach your behaviors or product recommendations. Timeframe: The timeframe for the specified behavior. This overrides the timeframe from the first step of the behavior. There are two Sources you can reference when populating a Dynamic Grid. Click the links below to learn more.